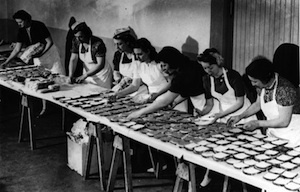 Participants are encouraged to use their "gastronomic creativity" to transform a pre-approved list of ingredients (pdf) from McDonald's menu items into a gourmet dish. Sounds familiar! The prize: Contest winners receive a stand mixer and a dinner prepared by Chef João Simões of Hotel Altis Belém in Lisbon, who is a partner in the contest and created the dishes in the contest's promotions. 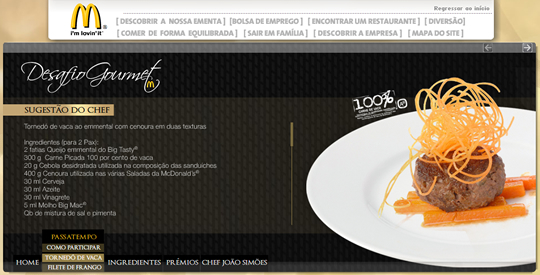 Above is an example from McDonald's website: tornedo de vaca ao emmental com cenoura em duas texturas, or Beef Tournedos with Emmental and carrots in two textures, using ingredients from salads and hamburgers. We got in touch with Erik R. Trinidad, the creator of FancyFastFood.com, and he told us: "I'm flattered that I've inspired McDonald's and their PR and ad agencies, but disappointed that they didn't approach me about it as I've sort of publicly coined the idea -- or is that in the works if and when this contest comes stateside?"